Andy Warhol‘s first international retrospective exhibition was held at Moderna Museet in Stockholm from 10th February to 17th March 1968. The idea for the exhibition came from Pontus Hultén, Moderna’s legendary director, and his friend and former student colleague Billy Klüver a friend of Andy Warhol’s convinced Warhol to participate. Warhol visited Moderna Museet in December 1967 to reconnoiter and agreed to submit works including some Brillo boxes, “Marilyns“, an “Electric Chair” painting, and a 10 foot “Flowers” both made specially for the show. Pontus Hultén sent his young assistant Kasper König to finalise the arrangements together with Warhol and Billy Klüver. 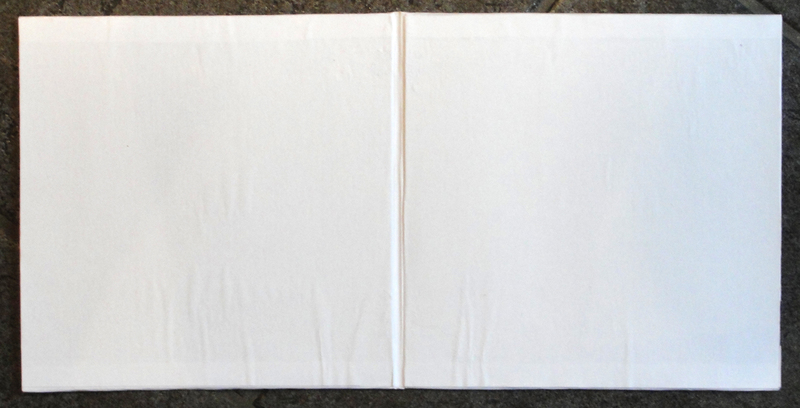 The catalogue, authored by Olle Granath, Kasper König and Pontus Hultén, with its “Flowers” cover became a cult item and several editions were produced. First editions came in a cardboard box with “Andy Warhol” printed on it. There was also a limited edition of 100 copies in a perspex box (apparently few of these were sold!) Olle Granath was charged with going through Warhol’s papers to select quotes for inclusion in the catalogue. When he had submitted them for approval, Hultén phoned him and told him he had missed an important quote that “In the future everyone will be world-famous for fifteen minutes“. Granath replied that he hadn’t found that particular quote. but it was printed anyway. This caused a certain amount of anxiety as to what Warhol would say when he saw the quote in the catalogue–but Warhol simple shrugged and said that it was the sort of thing he might well have said. And it has since been ascribed to Warhol rather than to Pontus Hultén! Moderna Museet decided to produce an exhibition in 2018 to celebrate the fiftieth anniversary of the original exhibition. The new exhibition was not intended to reproduce the original show (which would have been impossible) but to emphasis the impact that Warhol’s art had in Sweden (and Europe, as the exhibition later travelled to Oslo and the Stedelijk Museum in Amsterdam) at the time. This type of “exhibition study”, where a new show discusses a previous one, is becoming increasingly common in the museum world. Interestingly, in 1968, the year of student revolt in Paris and elsewhere, the reaction in the Swedish press was divided with the more left wing papers mostly approving and the more conservative ones damning the show as “non art”! As any nerd will note, one of these covers is not by Warhol. So I sought out John Peter Nilsson, the exhibition’s curator, and told him that the cover of the East Village Other‘s album was not by Warhol. I took the opportunity to tell him about my collection of Warhol (and other) covers. He saw to it the East Village Other cover was changed to Johnny Griffin’s “The Congregation“. He told me that Moderna had plans to show the exhibition at its sister museum in Malmö during 2019. Some time later, John Peter made a home visit to inspect my collection of Warhol record covers and suggested that he include a selection of my Warhol cover collection in the new show in Malmö. We agreed to show all the covers with Warhol‘s art that were produced during his lifetime, but not showing every single variation, in all a total of 81 covers. John Peter Nilsson holding his favourite Warhol record cover–“The Nation’s Nightmare” from 1952. In addition we decided to include some other items from my Warhol collection: the Aspen Magazine #3 from 1966, which includes the flexidisc with Peter Walker‘s “White Wind” and Velvet Underground‘s (in reality only John Cale) “Loop“, Andy Warhol’s Index (book), Warhol‘s “The Beatles” from the cover of Geoffrey Stokes‘ 1980 book of the same name and magazine covers with portraits of Michael Jackson and Prince and the promotional book from Miguel Bosé‘s “Made in Spain” album. The Warhol 1968 exhibition in Malmö was due to open on 30th March and run until 8th September 2019. I was invited to help oversee the final hanging of the record covers. These were framed with Wag the Wall‘s beautiful Magic Vinyl Display frames which really let the covers shine. One lone viewer in front of the record covers. The exhibition was designed logically with a large room devoted to the art shown at the 1968 exhibition at Moderna museet in Stockholm with nine Marilyns borrowed from Louisiana, Moderna museets own “Electric Chair“, “Multiple silver Marilyns“, and the ten foot “Flowers“. Also in that room were Warhol‘s print of his plane ticket to Stockholm, December 1967 and a Warhol self portrait (both owned by Moderna). An adjacent room showed the history of Warhol‘s Brillo boxes along one wall, whilst another wall was devoted to Andy Warhol Enterprises and Warhol‘s commercial art including a portrait of “Scandinavian Beauty“. There were three exhibition cases in the middle of the room. One held two of Warhol‘s “Red books” of Polaroid pictures, another magazines with Warhol art covers and a bottle of Warhol‘s 1982 eau de toilette för men with dollar signs on the bottle. The third exhibition case contained more record-related stuff from my collection including Margarita Madrigal‘s book “Madrigal’s Magic Key to Spanish“, “Andy Warhol’s Index (Book)“, “FAB“, the Aspen Magazine box from December 1966, a booklet from Miguel Bosé‘s “Made in Spain” promotional package and the “Swan Lake” and “Daphnis & Chlöe “LP covers. My record covers, 80 in all, were lined in five rows on the final wall, with some more in an exhibition case nearby. Exhibition case with Andy Warhol’s Index (Book), Aspen Magazine “FAB” issue, the program from the Concert of Mexican Music plus Miguel Bosé’s promo booklet from his “Made in Spain” album. There was a massive turn out for the opening evening on 29th March with crowds gathering in front of the record covers. One visitor had a large collection of records by the Velvet Underground and by Lou Reed and admitted to owning eleven copies of the Velvet Underground & Nico! Others stood in front of the covers pointing out which ones they actually owned. Many simply admired the early covers from the 1950s and others were simply overwhelmed by the sight of 80 covers on the wall. Posing in front of the wall of record covers. Photo: Helene Toresdotter. Moderna Museet’s director Iris Müller-Westermann held a welcome introduction followed by John Peter Nilsson who introduced the exhibition and described Warhol‘s art and philosophy after which the multitude could wander round the exhibition before a happening with a Swiss dance troupe took place. Then there was mingle in the cafeteria with shrimp cocktail and wine or beer and a DJ played Warhol-related music. A really warm and friendly meeting with what Iris Müller-Westermann judged to be one of the biggest crowds ever at an exhibition opening at Moderna museet in Malmö. The exhibition opened to the public on Saturday March 30th and curator, John Peter Nilsson, hosted two very popular guided tours of the exhibition. There were 1136 visitors to the show on the opening day–quite a turnout as the average number of visitors to openings at Moderna museet in Malmö is about 600. Even the curator’s tours were more popular than at previous shows. The guided tour Saturday 30th March. John Peter Nilsson beside the 25 Black & White Marilyns facing the crowd. The Internet is a fantastic research tool for collectors. One doesn’t have to buy anything but it provides a wealth of databases from which to search. Researching record covers has been made so much easier thanks to record databases such as Discogs, Musicstack and others. Even Ebay and Etsy are great databases to use in searches. I researched my post on Kate Moss on record covers entirely via the Internet. I owned three covers with Kate Moss’s portrait and bought a fourth as I found it available despite apparently being very rare. I have even researched Roy Lichtenstein‘s art on record sleeves via Ebay and Discogs without buying a single cover. So, despite a smug feeling that I already had ALL his record covers, I was doing my usual weekly search for Klaus Voormann’s record cover art a couple of weeks ago when a new cover appeared. A record by a group which went by the (not so lyrical) name of Paddy, Klaus & Gibson. 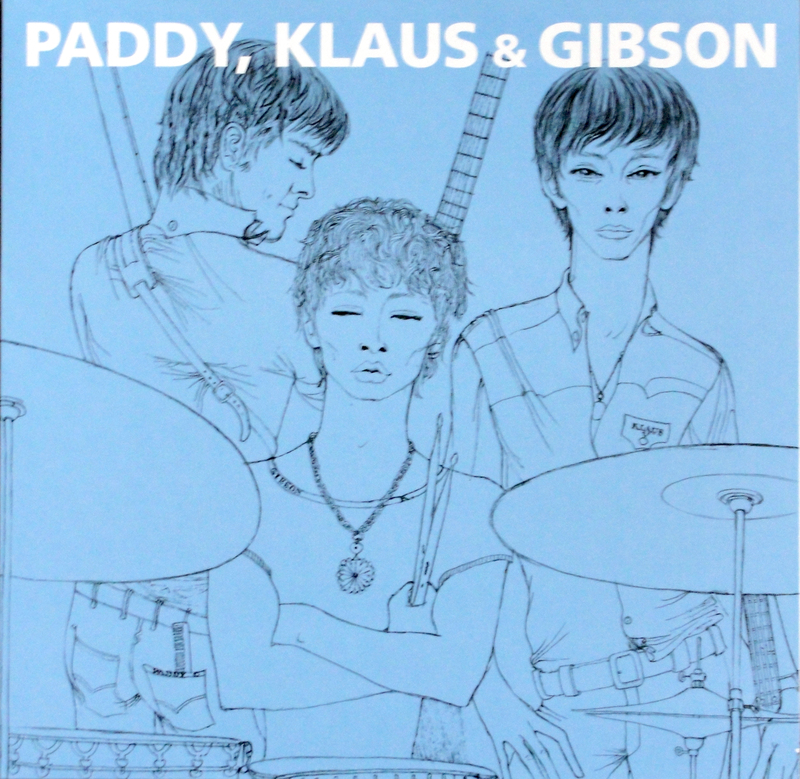 Paddy, Klaus & Gibson’s 10″ EP. A copy was for sale on http://www.ebay.de and I jumped at the chance. It turned out that the seller was famous German Thorsten Knublauch, collector of Beatles material from their Hamburg days and author of books on the Fab Four. He told me that fellow Beatles expert Dieter Hoffmann had produced this compilation album to document an early phase in Klaus Voormann‘s musical career. The following information comes from a blog post by Thorsten Knublauch reviewing the album (see: http://wogew.blogspot.de/2015/02/paddy-klaus-gibson.html). Klaus Voormann had bought ex-Beatle Stuart Sutcliffe‘s Höfner bass when he left the band and hopped into a band together with Paddy Chambers (guitar) and John Frankland (vocals, guitar) and Gibson Kemp (drums) called The Eyes. 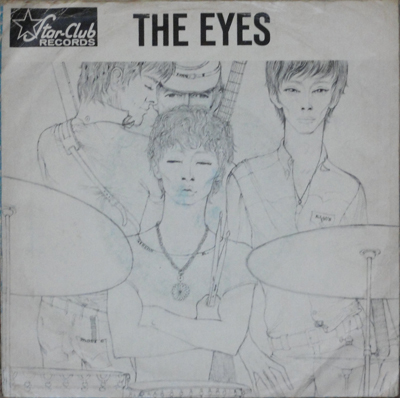 The Eyes released two singles and Klaus Voormann drew a band portrait on their “She / Peanut Butter” single cover. Paddy Chambers had previously been a member of legendary Liverpool band The Big Three, Gibson Kemp (who later married Astrid Kirchherr) has been drummer for The Hurricanes and John Frankland who had been a member of Kingsize Taylor & The Dominoes. And, yes, it’s the same drawing on the cover of the “Paddy, Klaus & Gibson” album, but with John Frankland (he in the cap peering over Gibson’s head) removed as he had left the band. Klaus Voormann had approved the revised cover design. The “Paddy, Klaus & Gibson” album was produced by Dieter Hoffmann to collect the six tracks released by the trio in 1965-1966. He produced 300 copies – 100 copies each on black, clear and read vinyl. After contacting Dieter – a fellow medical doctor – I also bought the black and red vinyl versions to complete the collection. So, once again I started to congratulate myself on “completing” my collection of Klaus Voorman record cover art when Thorsten Knublauch mentioned an early jazz album that Klaus had done a cover drawing for, much in the same style as his series for the “Pioneers of Jazz” series on the Coral Record label. The record, a radio broadcast recording, has the impossible title “Wer noch nie im Bett Radio gemacht hat“, which he translated as “Who never ever did radio in bed“. He even had a picture of the cover – a patient in a hosital bed hooked up to drop bottles. 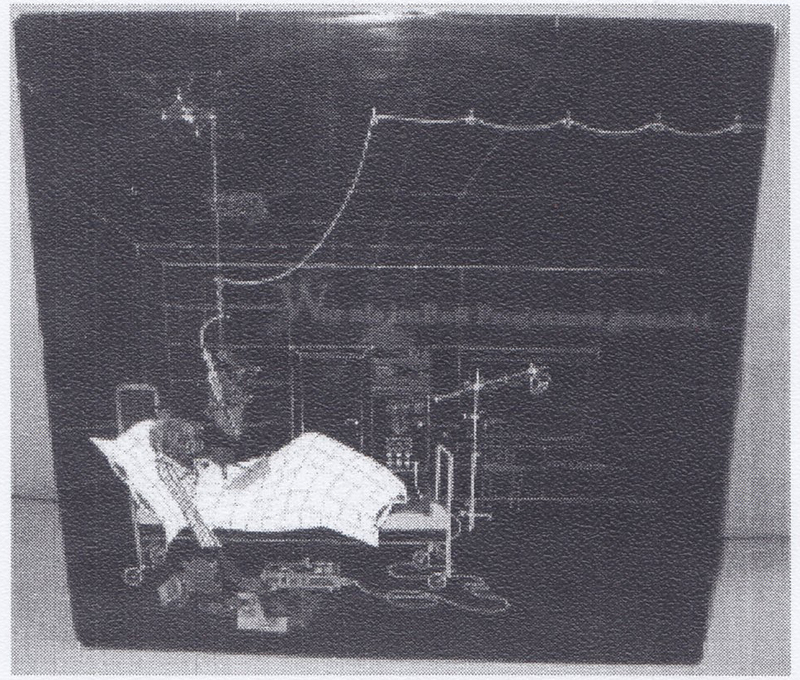 The cover of Klaus Voormann’s early Jazz LP “Wer noch nie im Bett Radio gemacht hat”. Well, I really have to do some serious research to find a copy of this, not only because it’s a Klaus Voormann cover, but because I really love the medical subject! So, dear readers, please excuse me if I do not post any further posts for the foreseeable future – I’ll be out looking for this album. 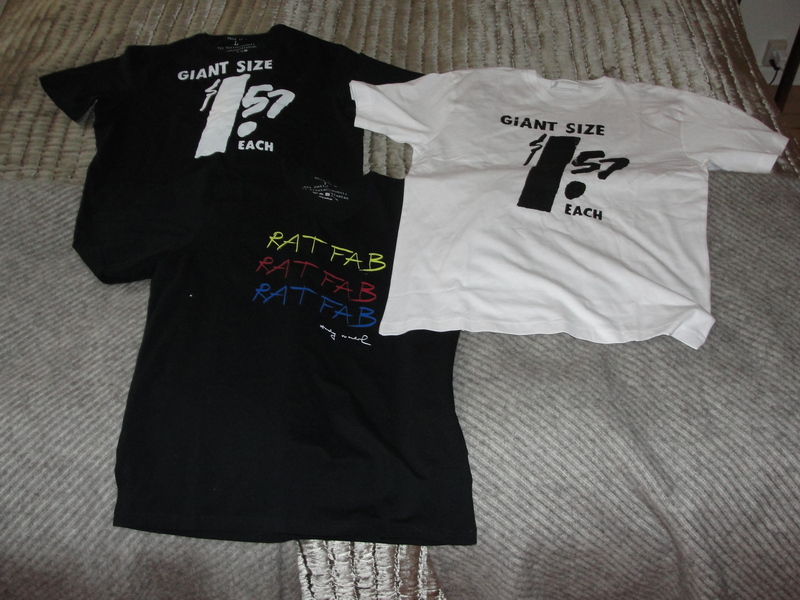 Followers of this blog will be happy to learn that I silkscreened T-shirts with the RATFAB design in sizes from ‘S’ to ‘XXL’. I’m pretty happy with the results. I also managed to print a couple more shirts with the “Giant Size $1.57 Each” design. I have now packed the sets of “Giant Size $1.57 Each” covers, the “Night Beat” boxes, the t-shirts and diverse other goodies and sent them off to my fellow Warhol Cover Club members. I hope the packages arrive in time for Christmas and that everyone is happy with my work! 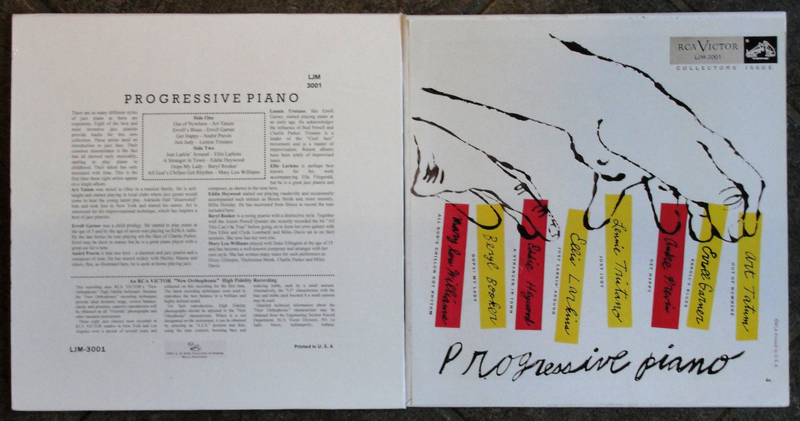 I have also completed my “Progressive Piano” ten inch LP and seven inch EP set. My first attempts at making a cover for this unreleased record were for a ten inch cover and a single seven inch sleeve. All I had were copies of the lithographs of the cover images for both ten and seven inch versions, but no liner notes for the ten inch or reverse for the seven inch cover. So I set about writing liner notes and making a layout for the reverse of the ten inch. I had to find, copy and add RCA logos, catalogue numbers and place them as they would have appeared had the record actually been released. My elementary Photoshop skills were not really up to doing a one hundred percent perfect job. But after much reworking I was satisfied and printed up slicks to glue to my already made card sleeves. Then all that remained was to fix the cover slick over the front of the cover. Voilá, a complete cover. I thought making the seven inch sleeve would be a doddle. I printed the cover slick for the seven inch and copied the rear from another RCA seven inch EP and put the two together. But – this seven inch cover listed eight titles. And everyone knows that only four tracks will fit on a a seven inch EP. So this release would have had to be a DOUBLE EP. Oooh! So it was back to the drawing board. This time I took the cover image from the ten inch version (I still can’t explain my reasoning on this), reduced it to the correct size for a seven inch and used the same rear cover design as I had for the single EP. 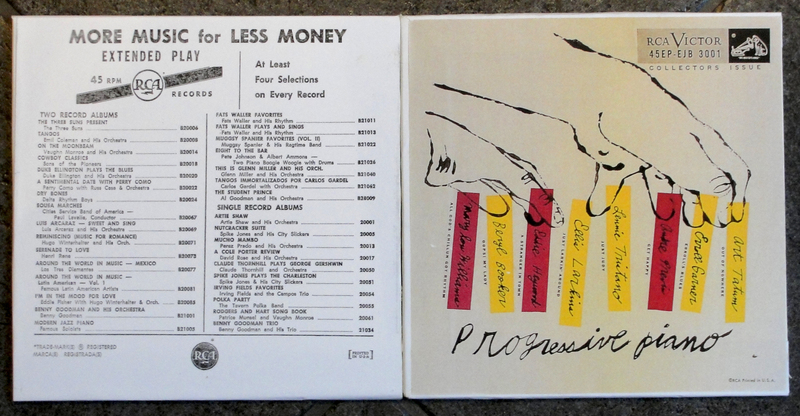 I had no inner liner notes so the inner spread was blank. This, I decided, was totally unsatisfactory. I had to at least add a tracklisting and some liner notes if the reproduction was to be at all convincing. 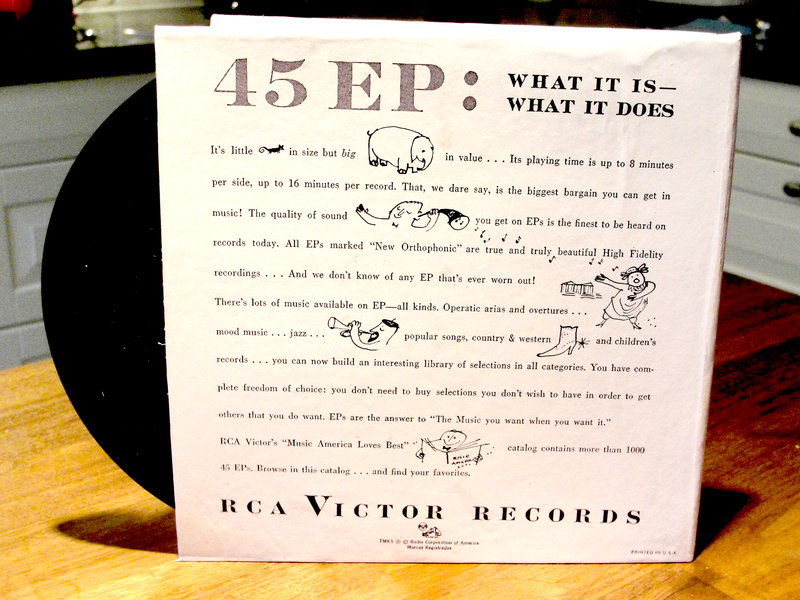 I went through a number of RCA gatefold EP sets and found an Ames Brothers EP from the early fifties that contained a list of other “Popular Long Play and Extended Play” titles, which I felt could be modified to suit my purposes. Said and done! I remade the layout of the liner notes I had already produced for the ten inch version of “Progressive Piano” and scaled them down and replaced the track listing. Then paired the liner notes with the list of popular jazz and classical titles that I had made after the list on the Ames Brothers’ EP. Then I made copies of the reverse from the seven inch “William Tell” double EP set – a design I have seen used on several of RCA’s gatefold seven inch EP sets and glued that to pre-cut cards in the form of a gatefold. Then stuck the inner within and – hey presto! 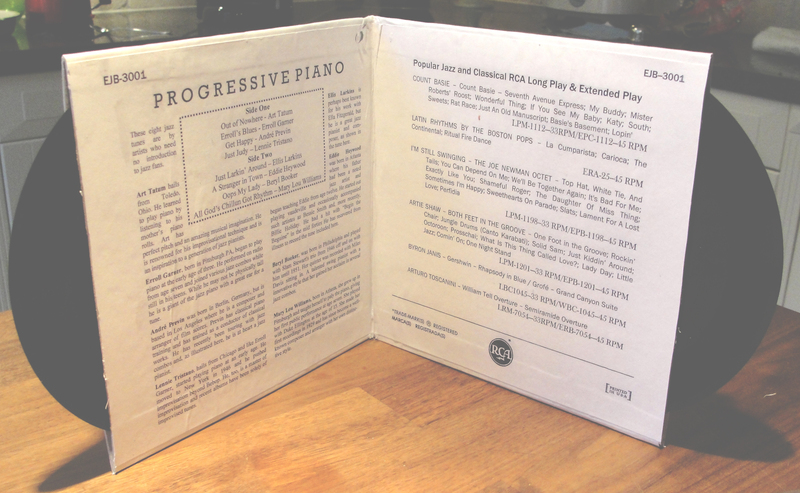 – a more authentic gatefold “Progressive Piano” EP set. Finally, this design satisfied my obessional desire for accuracy. 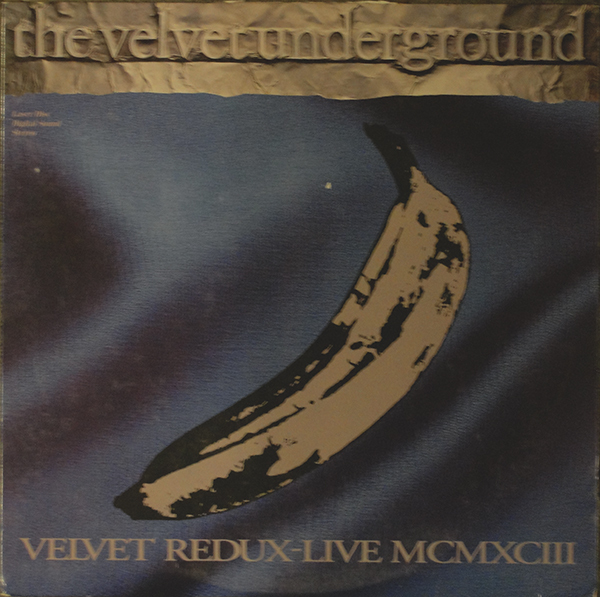 And, as if all this wasn’t enough, I received a copy of the Velvet Underground’s 1993 live album entitled “Velvet Redux – Live MCMXCIII” recorded in Paris on 15th-17th June 1993. The concert was released on double CD, abridged single CD, video and Laserdisc. I bought the laserdisc version as it has a 12″ LP-style cover. 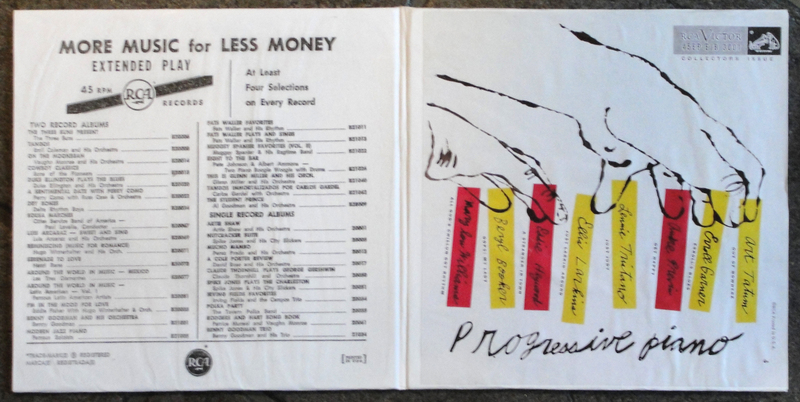 There are not many record or CD covers with an Andy Warhol connection that I am missing. I have saved myself a few thousand dollars by making my own copies of the rarest covers. I have the “Night Beat” box, “Waltzes by Johann Strauss, Jr.” and “Progressive Piano” covers in addition to all the other early Andy Warhol record sleeve art that I have collected. Now, I need to think up some new projects to occupy my thoughts over the coming holidays. I blogged about my longstanding project to make mock-ups of rare or unobtainable Warhol covers and this weekend I realised my plan. I have made a number of copies of covers for the “Progressive Piano” album – as a 10″ LP, as well as single and double 7″ EPs and also covers for The “Waltzes by Johann Strauss, Jr.” EP. I have made two versions of this cover, one that includes the “Printed in U.S.A.” test at lower right and one that does not. I also amused myself by attempting to make reproduction “Nation’s Nightmare” covers. This side project proved more difficult that I had anticipated and I was satisfied with the result only after three rather ragged versions. But, the cover looks to be in far better condition than my original! I have managed to Photoshop out many of the marks of wear and tear and these covers have no edge splits. I could not resist the temptation to make a copy of the RATFAB cover, Just for fun. 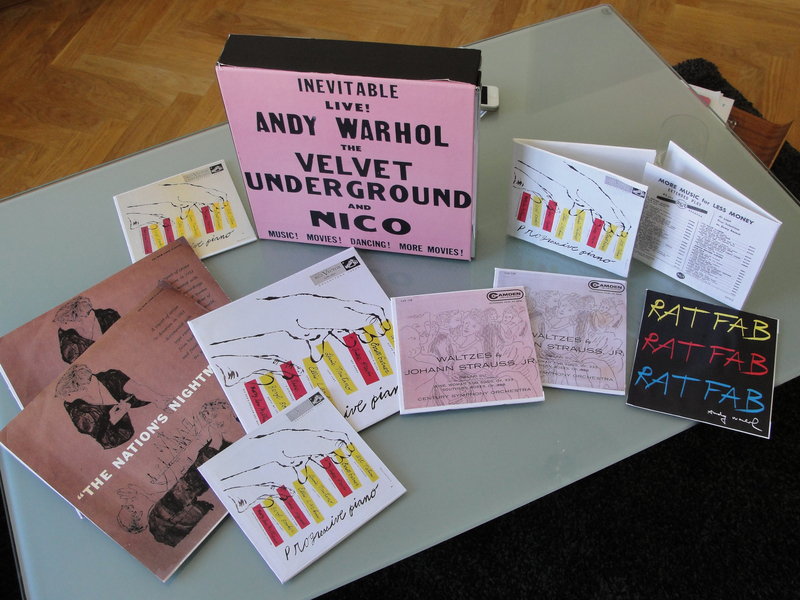 I bought the box set of the “Warhol Live / Andy Warhol – The Record Covers, 1949 – 1987” when it was forst published in 2008. But my copy mysteriously disappeared a couple of years later. Frank Edwards supplied me with a replacement copy of “Andy Warhol – The Record Covers, 1949 – 1987”, for which I am eternally gratreful. But I missed the “Warhol Live” book. So I invested once more and the new set arrived yesterday. It really is a beautiful and interesting read. There is so much information that I had never known. It is worth checking out.